Remember how Spec Ops: The Line wasn’t afraid to discuss the grisly, upsetting aspects of war? 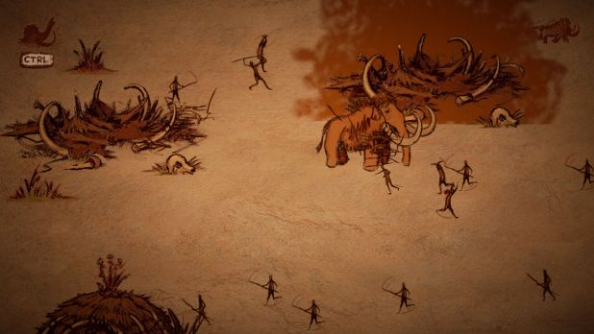 Three of the guys who worked on that shooter have gone on to make something very different with The mammoth: A Cave Painting, but it’s still a upsetting tale of loss and violence. And you can play it for free, should you wish to experience barbaric cavemen slaughtering your children. The Mammoth comes from inbetweengames, a small new indie studio formed by three ex-Yager staffers. Leaving the studio in the wake of the cancellation of Dead Island 2, the trio decided to make something personal and touching as part of Ludum Dare 33. The result is a beautiful 2D game about a mammoth escorting its children while hunters hurl spears at them. You can play The Mammoth for free by downloading it here. It’s also out on mobiles should you wish to take it with you on the bus. And if you’re taken by The Mammoth, the good new is that inbetweengames are working on a super secret project that will once again feature lovely 2D art. Look out for more from them in the coming months.